By Allan Fox: Murat Gassiev (26-0, 19 KOs) and Oleksandr Usyk (14-0, 11 KOs) will meet in the finals of the World Boxing Super Series tournament on July 21 at Olimpiysky Sports Complex in Moscow, Russia. The fight was finalized on Friday for July 21. 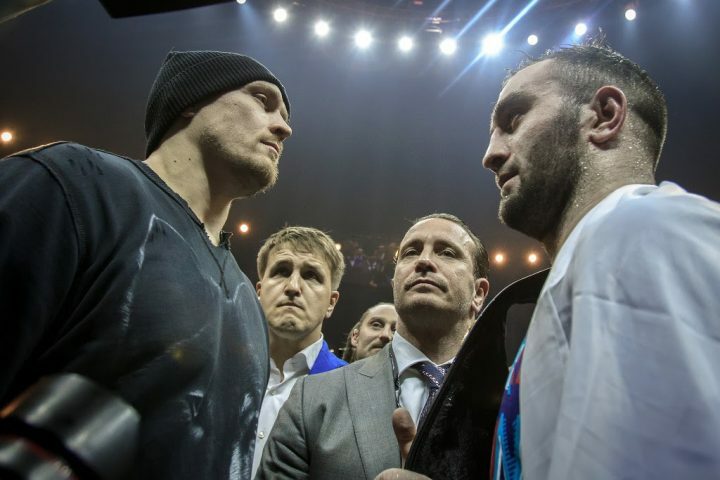 There had been talk of the Gassiev-Usyk fight taking place on July 21st in Moscow, Russia, but it wasn’t until this week on Friday that the fight was finally made official. The winner of the Gassiev vs. Usyk fight will capture the Muhammad Ali Trophy. The Usyk-Gassiev fight was originally scheduled for May 11 in Jeddah, Saudi Arabia, but an elbow injury to Usyk caused the contest to be postponed until July 21. There’s money to be made by both fighters by having it take place in front of a large crowd in Moscow. Gassiev is a popular fighter in Russia, and a large crowd is expected to turn out to see the two fighters. The winner of the Usyk-Gassiev fight will not only be crowned the winner of the WBSS tournament, but they’ll also be the unified champion at cruiserweight. This will be the first time in the history of the cruiserweight division that there’s been a unified champion. Up until now, there hasn’t been the interest from the various champions at cruiserweight to try and unify. The 2012 Olympic gold medalist Usyk would be the clear favorite in the fight if it had taken place a year ago, but with him coming off an injury and a less than impressive showing against Mairis Briedis in his last fight in the WBSS tournament, the younger Gassiev has a very real chance of winning this match. With the fight taking place in Moscow, Russia, there’s always the possibility of a controversial decision in favor of the 24-year-old Russian Gassiev. Hopefully that’s not the case because it would mar the World Boxing Super Series tournament, but you can’t rule it out. Gassiev’s youth, power, size and tendency to knockout most of his opponents makes it likely that if he wins, there will be no doubt in the minds of the fans. Gassiev will have his IBF/WBA cruiserweight titles on the line, and Usyk his WBC/WBO belts. This is the ideal fight for the cruiserweight division. It’s too bad the champions in the other weight classes aren’t always willing to face each other in unification fights because it would make things more exciting for the boxing fans. The winner of the Gassiev-Usyk fight will have bragging rights as the best fighter in the cruiserweight division. However, both guys are expected to move up to heavyweight immediatey after they face each other next month, as they want to go after the bigger paydays against the likes of IBF/WBA/WBO heavyweight champion Anthony Joshua and WBC belt holder Deontay ‘Bronze Bomber’ Wilder. th round knockout last September in Germany. Huck, 33, isn’t the same fighter he once was during the height of his pro career when he held the WBO title from 2009 to 2015. Huck has lost a large part of his game from the wear and tear of a long 14-year pro career and the natural aging process. Usyk traveled to Germany to defeat a past his best Marco Huck, and then he traveled to Latvia to beat Mairis Briedis. It’s going to be a lot harder for Usyk to beat Gassiev in Russia because he’s not old and over-the-hill like Huck, and he hits harder and doesn’t have the stamina problems that Briedis. Usyk would have lost to Briedis if he hadn’t gassed out in the second half of the fight. The 6’3” Usyk will need to use more movement against Gassiev than he did in his last two fights against Briedis and Huck. Gassiev hits harder and as I mentioned, he’s younger and a dangerous body puncher. In Gassiev’s two fights in the WBSS tournament, he defeated Krzysztof Wlodarczyk by a 3rd round knockout in the quarterfinals last October, and then stopped Yunier Dorticos in the 12th round last February. Gassiev waited until the knockout artist Dorticos fatigued in the later rounds before going after him and knocking him out in the 12th round. It was a simple strategy that was designed by his trainer Abel Sanchez. It worked well for Gassiev, but it made the fight a lot closer than it should have been. The fight was close enough for it to go either way going into the last three rounds of the contest. Gassiev can’t afford to fight like that against a skilled boxer like Usyk, as he’ll get on his bike and look to preserve the win by jabbing and moving. For Gassiev to beat Usyk, he’s going to need to go after him from the very start and look to make sure he hurts him and wins every round. Gassiev cannot let Usyk be close going into the last four rounds because he has too much boxing ability for the fight to be in the balance in the later rounds. Gassiev will need to make sure he puts pressure on Usyk for the entire fight if he wants to win, as this could be a game of cat and mouse. Usyk likes to bounce around the ring, jabbing and moving and trying not to get hit. Usyk isn’t going to just stand and fight Gassiev because the risk of getting hurt is too high. Gassiev is trained by Abel Sanchez, the same trainer that trains middleweight champion Gennady ‘GGG’ Golovkin. Gassiev is training in Big Bear Lake in California. He’s training with GGG, who obviously will have a lot of pointers for Gassiev in how to beat Usyk. It’s important that Sanchez have a better game plan for Gassiev this time than the one he used against Dorticos last February because this is a much different type of fighter. Gassiev will need a commanding lead going into the championship rounds to avoid Usyk trying to rally to win. As I mentioned, if Usyk has a lead going into the last three rounds, he’ll milk it and prevent Gassiev from staging a comeback. Gassiev beat Denis Lebedev by a 12 round split decision two years ago in 2016. That was a close fight. Gassiev’s superior punching power was the ultimate factor in him winning the fight. Gassiev knocked Lebedev down in the 5th round with a body shot. However, Lebedev still gave Gassiev problems with his high volume punching attack. The harder, cleaner landing shots came from Gassiev.